Hugo Boss crafts a precise chronograph that features separate subdials that help you track dubvisions of time. A clear 12 is included on the dial with large indices that enhance readability. A tachymeter is included on the circumference of the dial to help track speed and the bezel is clearly marked in five second increments to help you track speed. A vertical gold accent is included on the bracelet and buttons for a piece that is stylish as it is functional. 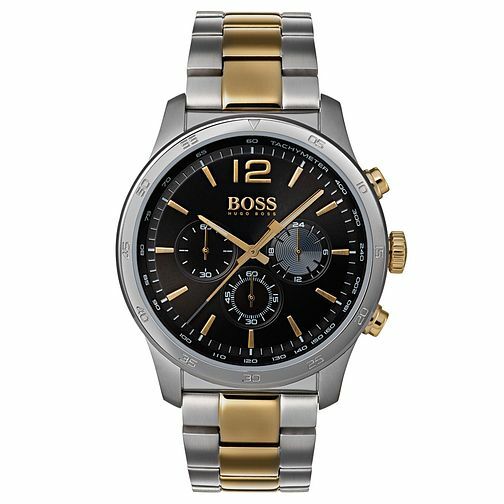 Hugo Boss Professional Men's Two Colour Chronograph Watch is rated 5.0 out of 5 by 1.